There are quite a few different variations on Spider-Man, and most of them live in different universes. What Spider-Man: Into the Spider-Verse, Sony's new animated Spider-Man movie, posits is: what if they were all jumbled up into the SAME timeline? The new trailer for Into the Spider-Verse was released today, and it's even wilder, stranger, and more colorful than the first one from June. Plus, this one kind of explains more of what's going on: apparently, the Kingpin has created a special machine that transports all the different Spider-Mans and Spider-Girls and Spider-People and Spider-Animals into the same universe, which sounds really dope until it all inevitably goes wrong. It's Peter Parker! Now it's Miles Morales! Miles has a hot dad! Now the Spider-Mans are working together! It's Gwen Stacy! It's Spider-Man Noir and Peni Parker, aka SP//dr, a Japanese teen girl who psychically copilots a mecha suit with a radioactive spider friend! By the way, were you aware that there are a lot of Spider-Man incarnations, because there are A LOT. 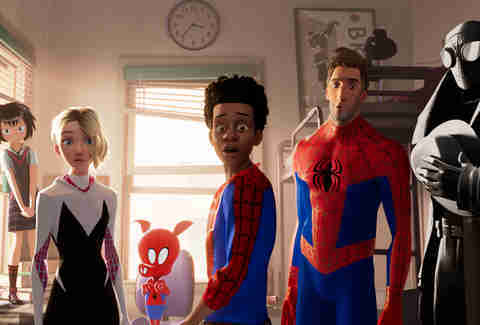 What's most exciting about this -- aside from the fact that it's Peter Parker and Miles Morales in the same movie, or that Nic Cage gets to voice a character, or that John Mulaney is Spider-Pig -- is how incredible the animation style is. It's CGI animation that looks like you're flipping pages of a 2D comic book, complete with occasional sound effects and thought bubbles. The animation studio, Sony Pictures Imageworks, created an entirely new style that combines three-dimensional CGI animation with linework and other comic book art techniques to make a completely unique look. This is one of those times, like with Avatar and The LEGO Batman Movie, where it's pretty much essential to watch it in 3D. The only bad news is that you have to wait until December 14 to see it all.